Judaica is the collective name for historical and literary materials related to Judaism, Jewish culture, and customs. It includes Jewish books, Jewish studies, Jewish religious artifacts, holiday celebrations, and in fact, anything pertaining to Judaism. Judaica also refers to gifts that are related to Jewish culture and religion. Three thousand years of Jewish culture across the world have produced a rich variety of religious items, artifacts, literary productions, music and art. 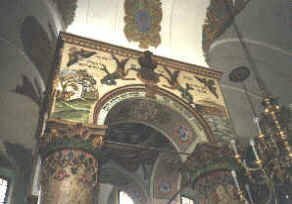 For example, the image at right shows the bimah, the place where the Torah is read, in the four pillared synagogue of Lancut, Poland, built in 1726 to replace a wooden structure destroyed by a fire. The synagogue is now a museum. Below is a Menorah, the seven branched lamp used in the temple. Mezuzah - (plural Mezuzot) - a small parchment scroll in a case affixed to the doorway of every Jewish house, with the text of the Shema Yisrael prayer, according to the text of Deuteronomy 6:4-9 and Deuteronomy 11: 13-21. Mezuzah - Learn more about the Mezuzah. Tallit (tallis or tallith) - Fringed prayer shawl garment. Learn more about the Tallit. Shofar - - a ram's horn, blown on special occasions, and particularly, to signal the new year. Learn more about the Shofar. Purim .- Celebrates the rescue of Persian Jews 2,300 years ago by Queen Esther with a carnival and noisemakers [March]. Passover (Pesach) -Passover signals the birth of the Jewish nation, and recalls the Exodus of the Israelites from slavery in Egypt. It celebrates early spring harvest, and has become a vehicle for giving children and families the elements of Jewish identity, as well as perpetuation of the Jewish national spirit which is inseparable from the value of freedom that is embodied in this holiday. It usually falls in April, often coinciding with Easter.